The Inverse spectral problem: How much geometric information about an object is encoded in spectral data? For example, viewing a bounded region in the plane as the surface of an exotically shaped drum, the question appealingly phrased by Mark Kac as “Can one hear the shape of a drum?” asks whether the spectrum of characteristic frequencies of vibration of the drum encodes the shape of the region. We also consider more geometric spectral data such as the “length spectrum”, the collection of lengths of closed geodesics. 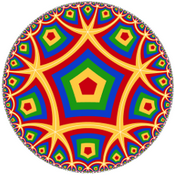 The symmetries of a Riemannian manifold form a Lie group. How are the algebraic properties of this Lie group related to the geometry of the Riemannian manifold? Geometry interacts naturally with nearly every area of mathematics. For example, the inverse spectral problem connects with analysis, combinatorics, group theory and number theory.